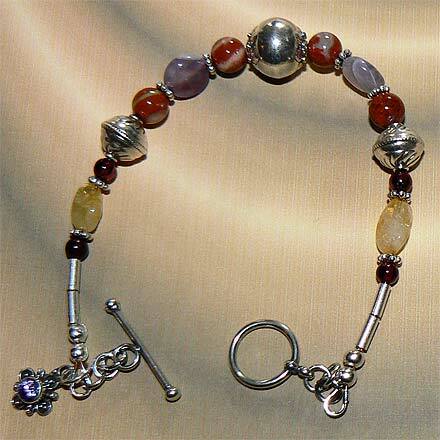 Sterling Silver Red Jasper with Quartz, Citrine, Amethyst and Garnet Bracelet. This is quite a unique centerpiece stone on the pendant. It's Red Jasper mixed with White Quartz--most unusual. The set is generously accented with Citrine, Amethyst and Garnet, for colors that are reminiscent of a late summer flower garden. For those who are interested in Astrological significances of stones, Jasper corresponds with Virgo and Leo, Citrine is November's birthstone, Amethyst corresponds with Pisces and the month of February, and Garnet corresponds with Capricorn, Aquarius and the month of January.